The game will be broadcast on local radio in Las Cruces and throughout New Mexico and carried on the Internet at ESPN3.com. The New Mexico State University Athletics Department joins the community of Las Cruces and the entire state of New Mexico to honor those who have served and who are serving in the United States Military during the game versus Texas State. The New Mexico State flagship radio station for football and men’s basketball is changing from 103.9 FM to 98.7 FM in Las Cruces. All football and men’s basketball games will be aired live and in their entirety. This move took effect for the first home football game on Thursday, August 28 at 6 p.m. (MT). The Aggie Athletic Department has a Twitter account at www.twitter.com/nmstateaggies where fans and media can get all their in-game scores. 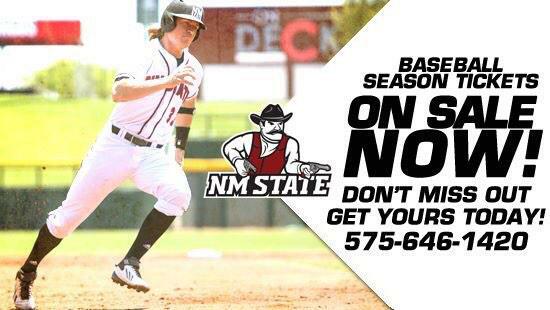 The Aggies also have a Facebook page where promotions and photo albums can been viewed at www.facebook.com/NMSUathletics. Don’t forget to follow us on Instagram at nmstateaggies for all the behind the scene info on your team. The New Mexico State football team fell 29-17 to Idaho in Sun Belt Conference action Saturday, Oct. 18 in the Kibbie Dome, falling to 2-6 overall and 1-3 in league play. The Vandals picked up their first win of the year and are now 1-6 and 1-4 in SBC play. Once again turnovers play a role in the outcome of the game for the Aggies with NM State throwing three interceptions and losing one fumble. Freshman quarterback Andrew Allen got his first career start and ended the game going 6-of-11 passing for 88 yards and one interception. Tyler Rogers, who made an appearance late in the game, recorded 3-of-5 passing for 12 yards and two interceptions. The Vandals recorded two turnovers to the Aggies four. More importantly, Idaho scored 16 points off turnovers, missing a two point conversion on one score. The Aggies scored three points off the Vandal interception. Larry Rose III had another big game for the Aggies, leading the team with 155 yards on 17 carries and two touchdowns. The Aggies recorded 100 yards passing and 140 yards on the ground, compared to Idaho’s 226 through the air and 310 on the ground. Vandal’s running back Jerrel Brown finished with 151 yards and a touchdown on 23 carries. The New Mexico State Aggies take on Louisiana-Lafayette during Homecoming, Saturday, Nov. 8 at 6 p.m. (MT). For tickets call the Pan American Center ticket office at 575-646-1420 or log online at www.TicketMaster.com. The Aggies look to take on the Texas State Bobcats, Saturday, Nov. 1, at home to start a three game home stand. The two teams have only faced each other once previously. Texas State defended their home turf with a 66-28 win over the Aggies on Dec. 1, 2012, in San Marcos, Texas. As of Oct. 23, Texas State was 1-1 in the SBC, losing 34-10 to UL-Monroe and beating Idaho 35-30. • Freshman quarterback Andrew Allen rushed for 118 yards against LSU on Sept. 27. He is the last freshman to score a rushing touchdown against LSU since former Oregon running back DeAnthony Thomas did so on Sept. 3, 2011. He is also the last freshman to rush for 100 yards against LSU since former Auburn and current Louisville tailback Michael Dyer did so for Auburn on Oct. 23, 2010. • Teldrick Morgan currently ranks No. 18 in the nation with 675 receiving yards and he is also No. 22 in the nation with 7.76 receptions per game. • Kawe Johnson is currently tied No. 16 in the nation with three forced fumbles on the season. • The NM State defense ranks No. 2 in the nation in passing yards allowed per game with 143.5. • The Aggies are also No. 3 in the nation for fewest Sacks allowed, with .63. After a loss to Idaho (Oct. 18) the Aggies fell to 1-3 in Sun Belt Conference play, dropping further in the conference standings. Georgia Southern leads the conference at 4-0 in conference play. UL Lafayette sits alone in second place at 3-1, while South Alabama holds No. 3 with a 3-1 record. UL Monroe and Arkansas State are tied for fourth with 2-1 records, followed by Texas-State in the middle of the standings at 1-1. Appalachian State and Troy are ahead of the Aggies with 1-2 records. The bottom of the standings is rounded out by Idaho at 1-4 and Georgia State at 0-4. Founded in 1976, the Sun Belt has adapted and evolved in its nearly 40 year existence. The Sun Belt Conference has a permanent seat on the NCAA’s 18-member Board of Directors. With the 2014-15 year marking the debut of the College Football Playoff (CFP) the Sun Belt continues to find itself among the 10 premier college football conferences and the new system is guaranteed universal access based on performance – there are no automatic qualifiers for the playoff system. Additionally, the CFP will mean that a spot among the premier bowl games of college football will be guaranteed to the highest-ranked champion from the other “Group of Five” conferences: the Sun Belt Conference, American Athletic Conference, Mountain West Conference, Mid-American Conference and Conference USA. With the College Football Playoff included with the league’s other bowl arrangements, the Sun Belt Conference is tied to seven total bowl games. The R+L Carriers New Orleans Bowl, the GoDaddy.com Bowl, the Raycom Media Camellia Bowl, the Cure Bowl (debuting in 2015) all guarantee a home for a bowl eligible Sun Belt Conference team each year. And beginning with the2016 season, the Sun Belt is also part of a rotation of conferences that will send a team to the Bahamas Bowl and the Miami Beach Bowl. The Sun Belt’s 21 non-conference football wins in the 2013 season was a new record for the league - eclipsing the mark of 19 set the year prior. Additionally of note for the league’s non-conference win total was that the Sun Belt fared well against its peer opponents in the non-AQ BCS ranks. The Sun Belt finished a combined 8-1 against members of Conference-USA (4-1), the Mid-American Conference (3-0) and the Mountain West Conference (1-0). The Sun Belt also had the best overall non-conference win percentage when comparing the four non-AQ conferences. The Aggies currently have seven players listed in the NFL. The most recent of those players picked up by NFL teams are Davonte Wallace and Austin Franklin. Wallace was picked up by the Miami Dolphins this year and is currently listed as a rookie. Wallace played in 36 consecutive games for the Aggies, earning two second team All-WAC awards. He was the first offensive lineman to do so since 2004. Franklin was picked up by the St. Louis Rams this year and recorded one reception for 15 yards and a touchdown in preseason. In 2012 Franklin was the Aggies leading receiver, leading the team with 74 receptions for 1,245 yards and nine touchdowns. He also led the team in all-purpose yards as the lead returner for the team as well as a receiver, with 1,627 total yards and 135.6 total yards per game. Other recent additions to the NFL are second year DB Jeremy Harris for the Jacksonville Jaguars and WR Chris Williams, who is in his second year for the Chicago Bears. Kyle Nelson is in his third season at backup center for the San Francisco 49ers. Davon House is the most active Aggie in the NFL currently, playing for the Green Bay Packers. House has recorded nine tackles and one assists on the season, with one forced fumble. NM State found some success in the air last season, throwing for a total 2,886 yards. The two main quarterbacks for the Aggies were Andrew McDonald and King Davis III. McDonald threw for 2,497 yards going 235-for-350. He threw 11 interceptions and 15 touchdowns on the year. Davis went 26-for-51 with one interception and two touchdowns. The Aggies were only out thrown by 114 yards in the air, with their opponents throwing for 3000 yards on the season. The Aggies longest pass of the season was an 85-yard bomb to Austin Franklin against Rice on Oct. 19. The Aggies averaged a 132.88-quarterback efficiency rating in 2013, with McDonald leading the way with a 134.36. Tyler Rogers started the season at quarterback for the Aggies in 2014, coming in as a sophomore from Arizona Western where he played one season. Rogers threw for 1,832 yards at Western, recording 14 touchdowns and seven interceptions. He rushed for 364 yards and a team high 10 touchdowns as well. In high school Rogers threw for almost 6,000 yards in his career, including 76 touchdowns for Liberty High School. The success as a pass first team has carried into this season, as the Aggies have recorded 1,875 yards passing on the season thus far, compared to opponents 1148. Rogers has recorded 1,755 yards passing on 170-275 passes. He has thrown for 11 touchdowns and 15 interceptions. Rogers favorite target this season is standout wide receiver Teldrick Morgan, who has caught 53 passes for 675 yards and five touchdowns. True freshman Andrew Allen was named the Aggie starting quarterback against Idaho (Oct. 18). Allen went 6-of-11 passing, recording 88 yards and one interception. On the season Allen is 10-of-16 for 120 yards, with a long of 53. NM State boasts a talented receiving core that features five of last year’s top six receivers led by seniors Jerrel Brown and Adam Shapiro. The Aggies tend to spread the wealth amongst the receiving core, which makes any receiver capable of being a threat to make a play. Of the five receivers who return from a year ago, each of those players appeared in every game last season. Each player also managed to catch at least 20 passes and gain at least 200 receiving yards a season ago. Although the Aggies have a lot of experience among their receivers, they still are receiving production from their younger wide-outs. Redshirt sophomore, Teldrick Morgan led the way for the Aggies in their season opener against Cal Poly on Aug. 28, where he recorded six receptions for 51 yards and caught the first touchdown of the season for the Aggies on the initial drive of the game. Redshirt freshman, Gregory Hogan served as the full-time punt returner and kick returner for the Aggies in the first game, which appears to be his role going forward. The receiving core is continuing to play a major role in the Aggie offense, averaging 234.4-yards a game and 10.4-yards a catch. NM State has 1,875 passing yards on the season, compared to their opponents 1148 yards. Morgan leads all NM State receivers with 53 catches for 675 yards and five touchdowns. Joseph Matthews is second on the team with 25 catches for 284 yards and three touchdowns. Aggie freshman running back Larry Rose III was named to the Earl Campbell Tyler Rose Award Watch List Aug. 20, one of 43 players and one of only two freshman named to the list. The Earl Campbell Tyler Rose award recognizes the top offensive player in Div. 1 football who also exhibits the enduring characteristics that define Earl Campbell: integrity, performance, teamwork, sportsmanship, drive, community and tenacity. More specifically, the tenacity to overcome adversity and injury in pursuit of reaching goals. In addition to those attributes, the athlete must be born in Texas and/or graduated from a Texas high school and/or played at a Texas-based junior college or four year college. Rose is from Fairfield, Texas, where he attended Fairfield High School. Playing running back and defensive back, as a senior Rose was named the Associated Press Sports Editor Class 3A Offensive Player of the Year and a first team all-state selection. In the season thus far, Rose has 102 carries for 530 yards and five touchdowns. Rose leads the Aggies on the ground even with having missed 11 quarters of play due to injury. Rose averages 5.2-yards per carry and 88.3 yards a game. He rushed for 2,924 yards on 237 carries and 49 touchdowns his senior year. He also caught nine passes for 114 yards and three touchdowns. His season high was six scores in one game. Rose helped his team to a 15-1 record, the state championship game, and the No. 19 ranking in the state of Texas. Defensively Rose recorded seven tackles, six pass breakups and one interception. Of the 43 players to be named to the watch list, there are nine conferences represented as well as three independent schools. By position, 17 wide receivers, 12 running backs, eight quarterbacks, three tight ends, two fullbacks and one halfback were selected for the watch list. In the season opener against Cal Poly on Aug. 28, Rose had 30 carries for 149 yards and one rushing touchdown, with a long of 24 yards. Rose also had four receptions for 13 yards and a receiving touchdown. The NM State offensive line has done an outstanding job this year in protection, ranking among the best in the nation. Allowing only five sacks on the season, the Aggie line ranks No. 3 in the nation and first in the SBC with only .63 sacks allowed per game. Two of the recorded sacks came off intentional grounding calls. The OL has recorded a total of 87 knockdowns and 28 pancakes. Valerian Ume-Ezeoke leads the line with 29 knockdowns and 11 pancakes. Andy Cunningham, a two year starter at offensive tackle, recorded 14 knockdowns and one pancake before being sidelined for the season with an injury. While a major loss to the line, the Aggies have stepped up and filled the spot. The Aggies secondary is one of the best in the nation, sitting at No. 2 in the rankings. Behind No. 1 San Jose State (94.5), NM State has only allowed 143.5 yards through the air per game. The two defensive highlights of the year game against Cal Poly (Aug. 28) and Georgia Southern (Oct. 4). In the season opener against Cal Poly, the Aggies only allowed six yards through the air. Against Georgia Southern the Aggies only gave up 18 yards passing, containing the opposing quarterback to a dismal 3-of-13 passing night.